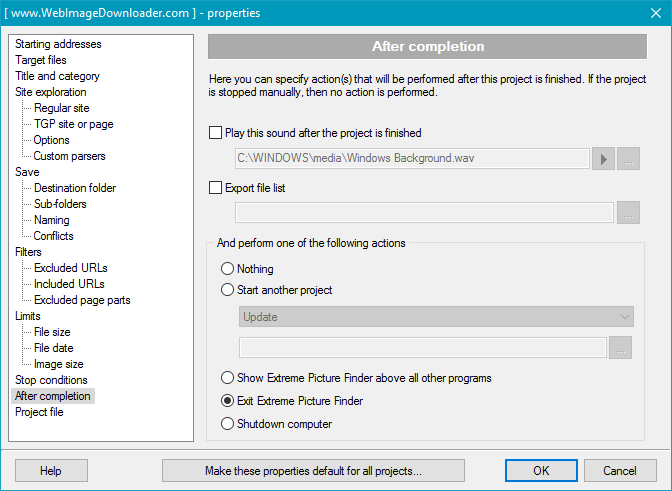 Extreme Picture Finder is a software for Windows which makes it easy to download images automatically from almost website. 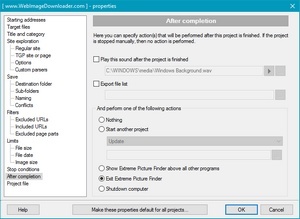 And you can use it with the built-in Windows Task Scheduler in order to automatically start/resume the downloads on regular basis. Here is a short tutorial on how set this up. First of all, please download the most recent version of the program using this button below. OK, let's say you have a project which downloads images from a frequently updated website and you want to automate the process: make Windows start Extreme Picture Finder every day at 1pm, download new images from the website (use Update option on the the project) and close Extreme Picture Finder after it's finished (if you need a tutorial on how to set up a project, then here it is: download all images from website). 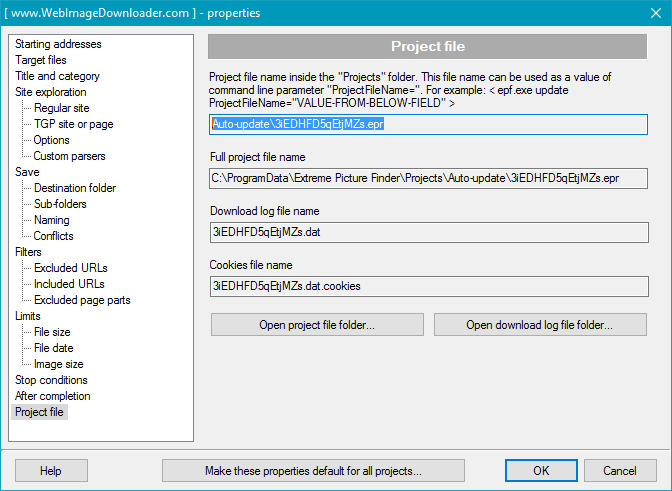 Open the project properties and select the After completion section. 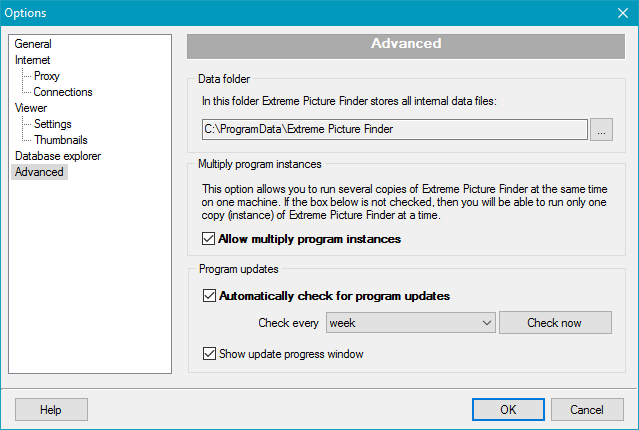 In the list of actions select Exit Extreme Picture Finder to make the program close after the download is finished. 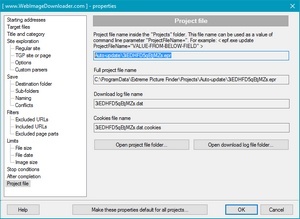 Then select the Project file section and copy the content of the topmost field called Project file name inside the "Projects" folder to the Windows Clipboard. We'll need this information for Windows Task Scheduler later. Now you can click OK to close the project properties window and save the project settings. 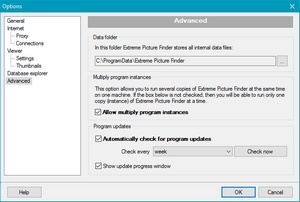 There is one more thing to do in Extreme Picture Finder - allow multiple instances of the program to run simultaneously. It's required to process command line parameters correctly, plus it'll allow you to run several download projects simultaneously. 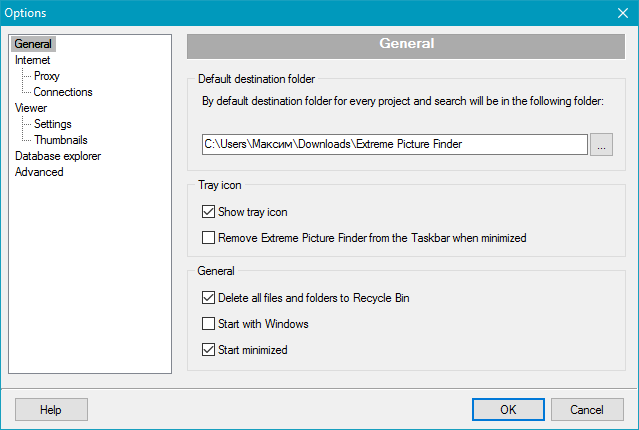 So open Extreme Picture Finder options (menu item Tools - Options...), select the Advanced section and check the Allow multiple program instances box. Another useful option in the General section - Start minimized which makes Extreme Picture Finder hide main program window and do all the work in the background. Click OK to save the settings. update ProjectFileName="PASTE THE PROJECT FILE NAME FROM CLIPROARD HERE"
This is it. 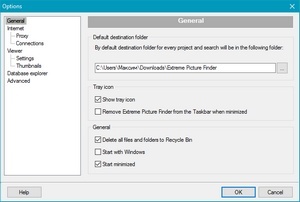 Now save the task and enjoy the automatic downloads with Extreme Picture Finder. With any questions about scheduling automatic image downloads with Extreme Picture Finder - write us at support@exisoftware.com, we'll be glad to help! Also, please check out the Extreme Picture Finder forum where we answered hundreds of questions already.